< Vanessa Bittner from Austria wins the 1000m Ladies in 1:20.09! Kai Verbij from the Netherland wins the 1000m Men in 1:12.84! 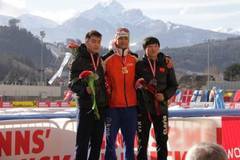 The YOG-gold medialist from 2012 Fan Yang from China gets second in 1:13.90 followed by his countryman Liu Yiming in 1:14.17.